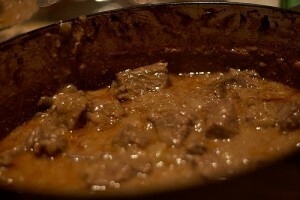 Dum Ka Gosht recipe by Nazia at DesiRecipes.com. Mix the first 14 ingredients, i.e. from the yogurt to the cummin seeds. Apply this mixture all over the meat pieces and let it marinate for 2 hours. Then fry the onions in the heated oil till they are light golden. Add the meat to the onions and stir occasionally. Cook till the meat is tender and flakes off slightly. When the oil floats on top, give dum of coal i.e put the piece of coal directly on a flame. When it becomes red put it on a small piece of roti or bread or a small receptacle made of aluminium foil. Place this in the pan cobtaining the food. Pour 1 tsp. of oil on the piece of coal. Immediately cover the pan with a lid for 5 minutes. This gives the food a barbecue flavour. Garnish with the coriander, mint and spring onion . Serve with hot rotis and lemon slices.